Cars were still a pretty new invention in 1911, especially in the more rural areas of the United States. Film was also pretty new, but with the boom of Nickelodeons opening across the country, more people of different backgrounds were going to the movies and demanding more content they could enjoy. This movie, like a number of others I’ve looked at, shows how film as a medium exploited the fascination with speed and technology in general. Alkali Ike (Augustus Carney) is a fairly typical rural “bumpkin” character – the type of Village Idiot that cityfolk think is typical of the sticks and that rural folks recognize as belonging to the neighbors. 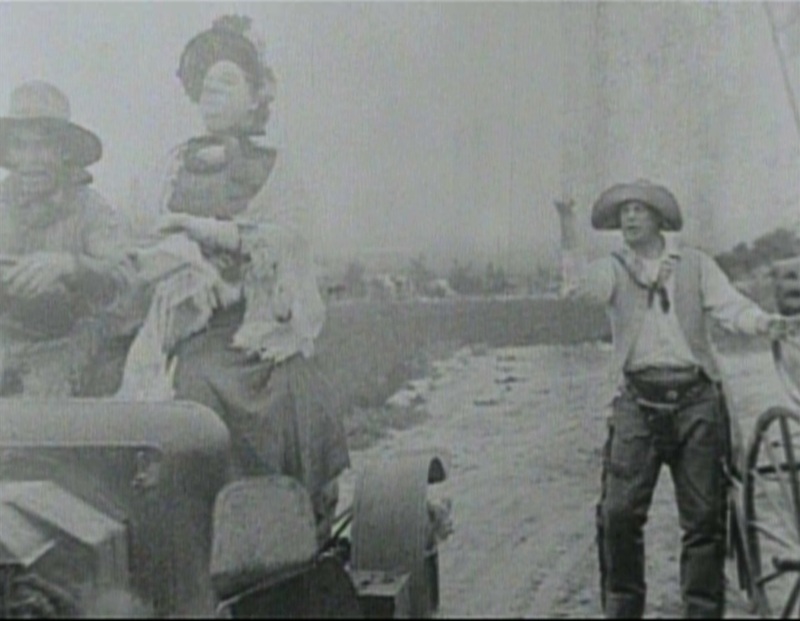 In this movie, he has a counterpart or rival, the taller “Mustang Pete” (Harry Todd). The object of their competition is a woman named Betty Brown (Margaret Joslin). 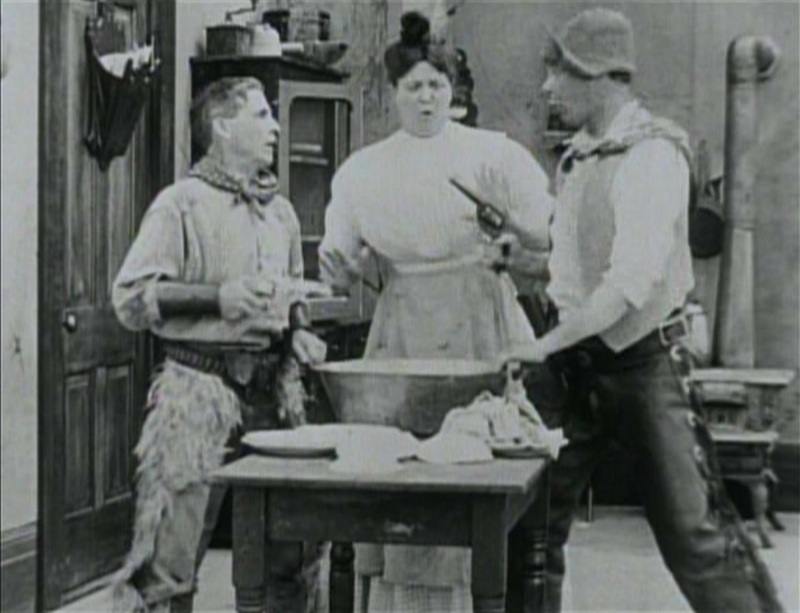 First, they both try to help her with her dishes, but she is annoyed by their constant squabbling over who will dry the next dish, which sometimes leads to their pulling their guns on one another. They try to “cooperate” in carrying the basin of water, but actually their fighting over who will carry it results in Betty getting splashed with dirty dishwater. Next, Ike wants to take her for a horseback ride, but Pete wins by showing up in a horse and carriage. Betty goes off with him, and Ike, despondent, leads his horses to the general store. Now a stranger drives up in an automobile. 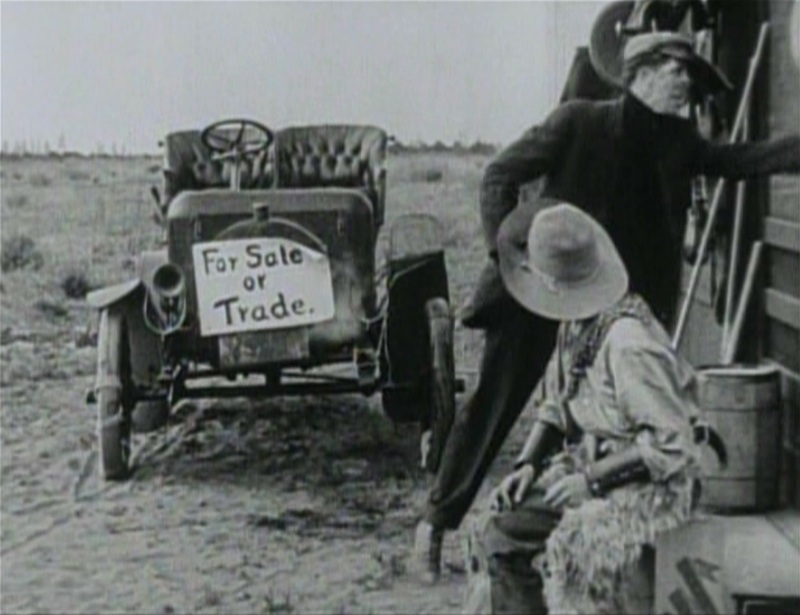 The audience is tipped that the car is in bad shape when the store owner refuses to buy at any price, but Ike misses this key bit of information and offers to trade his horses for the car. The stranger, no doubt happy to have a reliable means of transportation to get out of this backwater, accepts, and gives Ike brief instructions on driving. Now Pete and Betty ride up in their horse & carriage. Betty is excited to be offered a ride in a horseless carriage, and climbs aboard with Ike, who drives it through town and knocks over a post in front of the store. Betty is patient, however, and he does keep it on the road for a while, before ominous steam starts coming from under the cap. The car stops, and the steam turns into a spray of water aimed at Betty. Ike gets out to look and see what he can do about it, then the car starts up on its own, tearing down the hill with Betty aboard. 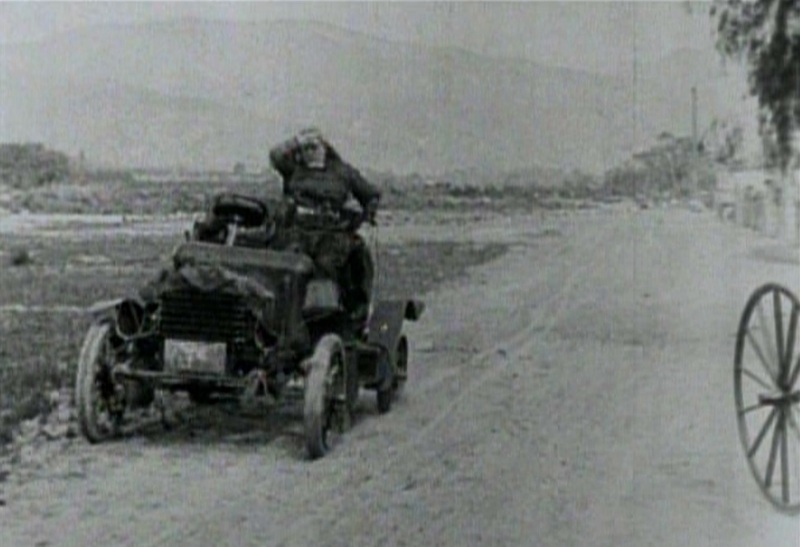 The car crashes at the end of the ride, and Betty is pitched across the hood into the mud. She is furious when Ike catches up and grabs him by the throat. There are a number of interesting things about this movie. One is that Betty is not at all the typical love-object, or even any sort of movie farm girl, but rather a large, matronly type, physically larger than either of the male suitors. My initial assumption (based on my familiarity with the genre combined with my own prejudices) was that she was a wealthy widow that the men wanted to marry for land and/or money. However, the Intertitles never say any such thing. Maybe her appearance is part of the comedy, or maybe it was assumed that she was the sort of person a bumpkin would be attracted to. The movie as a whole is pretty typical of the pre-Keystone comedies of the time. We get no close-ups on anyone, relying on broad physical gestures and costume to tell us what we need to know about character and motivation. Editing is limited, usually just linking one sequence to the next rather than allowing for intercutting between scenes, and the slapstick action is mostly tame by comparison to a Keystone movie. Carney was a well-known Essanay player, and apparently this movie was one of their biggest hit releases for 1911, leading to a remake in 1913. He and Mustang Pete would appear in a number of future shorts together as well. In 1914 Carney would go to Universal in search of higher pay as “Universal Ike,” sans Pete. Another successful series of shorts was released, but Carney still demanded more money until Universal terminated his contract and most of his career. His friend Christy Cabanne occasionally gave him supporting roles after that, as in “Martyrs of the Alamo,” in which he was a soldier. By 1916, he was out of film altogether, and he died in 1920.